152 mm/45 Canet naval gun8 х 1 pcs. Initial HE Shell Velocity753 m./s. Initial AP Shell Velocity792.5 m./s. 75 mm/50 Canet naval gun12 х 1 pcs. Diana Lima — Soviet promo premium Tier II cruiser. Being a protected cruiser — whose design was typical between the end of the 19th and the beginning of the 20th century — Diana had a reasonably good main battery for her time. The ship was also armed with numerous secondary battery guns. Her vital parts were protected by inclined deck armor. This re-skinned version of Diana is available exclusively as an invite code exclusive to selected motherboards or graphics cards from ASUS. 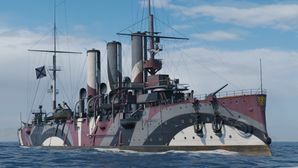 Diana in game is very similar to her sister ship, Tier III Premium cruiser Aurora. She has fewer main guns than Aurora, but she makes up for it by having secondary batteries. Having secondary batteries for close quarters fight. Very slow ship speed and turning. Shell flights are high arcing and slow velocity. As a Premium ship, Diana Lima doesn't have any upgrades to research. As a Premium ship, Diana Lima comes included with Type 9 camouflage that lowers her detection radius, reduces the accuracy of incoming shells, reduces her repair costs, and increases the amount of experience she earns. Diana (Russian: Диана) was the second of three Pallada-class protected cruisers built for the Imperial Russian Navy. The cruiser served during the Russo-Japanese War and took part in the Battle of the Yellow Sea on 10 August 1904. Later, she served as part of Russian Baltic Fleet during World War I.
Diana and Retvizan in transit at Weh Island, Dutch East Indies, on their way to Port Arthur in 1903. This page was last modified on 10 May 2018, at 15:41.